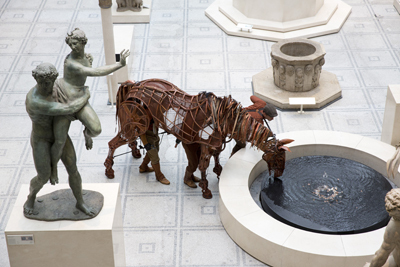 Joey, the puppet horse used in the West End play War Horse, has taken up a new home at the V&A in South Kensington. Created by the Handspring Puppet Company for the National Theatre’s adaption of Michael Morpurgo’s novel, Joey appeared in more than 1,640 shows since his debut at the New London Theatre on 28th March, 2009. He will now be housed in the V&A’s Theatre and Performance Gallery in a specially created display which shows how the puppet was operated on stage and features three mannequin puppeteers to illustrate the process. Joey was donated by Adrian Kohler and Basil Jones of South Africa’s Handspring Puppet Company who designed and created the puppets used in War Horse. War Horse, which continues its run at the New London Theatre, has been seen by more than four million people. For more, see www.vam.ac.uk. PICTURE: Joey at the V&A operated by Nicholas Hart (Head), Stuart Angell (Heart), Thomas Goodridge (Hind). © Victoria and Albert Museum, London.